LOCALS are urged to put a few hours aside this Sunday to lend their support to two Warrandyte Junior Football Club teams who have made it through to the grand final in the Yarra Junior Football League. The two teams are the Under 14s (above, celebrating a recent victory) and the Under 15s (below), who both will play at Victoria Park Lower at 12.30pm and 2.45pm respectively, which means the Red & White army of supporters can set up camp at the one venue and watch the two Grand Finals in a row. Both teams have not only made the big dance, but are red-hot favourites and had the luxury of a weekend off after smashing victories last Sunday week. The U15s finished their year second on the ladder with an impressive nine wins from 14 matches. They came into their semi final full of confidence after winning their last three matches of the season. 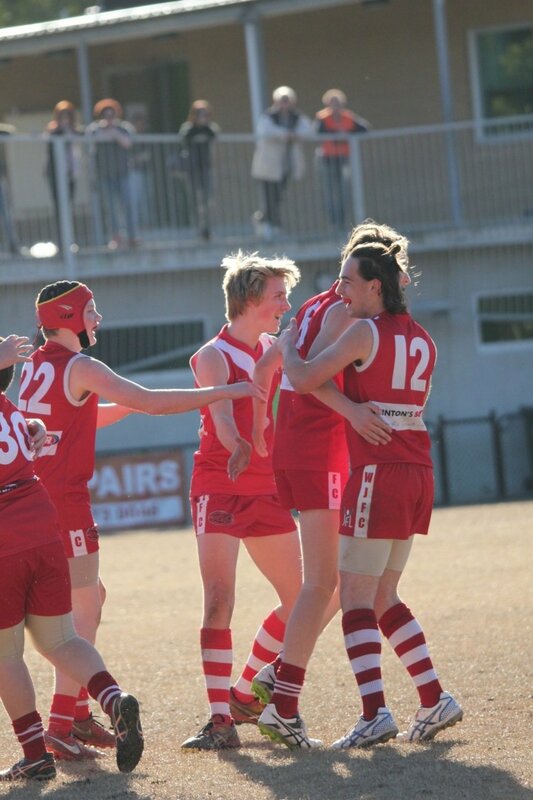 In the first week of the finals the Bloods travelled to Bundoora, who finished on top of the ladder, only losing four matches all year. Our boys dished out an impressive performance and gave the home team a lesson as they smashed Bundoora 14.14.98 d 5.4.34. The win meant the U15s could progress straight to the Grand Final and have a week off. Eugene Hanson, coach of the U15s, spoke passionately about how the boys were ready to go and had the potential (playing at their best) to win the Grand Final but had to learn to control their emotions. “I told them don’t think about the game itself, it’s very important to make the build-up as normal as possible,” he said. The U15 boys will go into the Grand Final clear favourites as they do battle with Macleod at Victoria Park Lower in Kew at 2.45pm this Sunday (August 28). The good news is our Bloods have beaten Macleod twice throughout the season by comfortable margins. A flag is looking good. On the same day the U15s rocketed into the grand final, shortly after the U14s followed suit, giving Doncaster no chance of even a sniff of victory as they ran over them 13.5.83 to 5.12.42. The U14 team’s road to the finals was solid as they finished the regular season on top of the ladder, winning 11 of their possible 15 games, including only one loss in the last 11 (to Preston who was bundled out last week). What made the U14s semi final win even more impressive was that Doncaster finished second, also on 11 wins, with only percentage separating the two teams. Warrandyte will battle it out with Banyule in the Grand Final after the Bears beat Doncaster in the preliminary final by one goal on Sunday. U14s coach Andrew Wallace says he is very confident and reckons if the boys “stay strong and work as a team” and “keep their heads up until the final siren” they can pull off a win. Warrandyte’s U14s will play Banyule at Victoria Park Lower, Kew, at 12.30pm this Sunday (the match before the U15s). Both coaches and the rest of the WJFC urge Warrandytians to head down to the grand finals this Sunday and support our young Bloods as they hunt for flag glory. About 350 residents attended an information session run by Vic Roads at the Warrandyte Community Church last month, an event facilitated and encouraged by (not run by) the Warrandyte Community Association. Residents were somewhat unclear as to the form this event would take. Some had expected a sit-down meeting with presentations, some had expected workshop sessions and others had expected a less formal static presentation where residents could “drop-in” at some point in the evening. It was also unclear beforehand as to whether VicRoads were using this as a method of disseminating information as to what they were proposing or alternatively seeking community views before the design being finalised. Attendees were asked to register their details and were provided with a brochure Information Update. On entering the main hall attendees found a number of tables displaying the proposed plans, each staffed by one or more VicRoads staff who were kept busy all evening discussing details with residents. It was difficult to know whether each table was displaying some different scenario so attendees were expected to attend each table, or whether the information was the same at each table. Police were present and happy to discuss evacuation scenarios. Two “focus group” sessions had been scheduled in another room. Much of the information provided in the Information Update has already been covered in earlier editions of the Diary. It became obvious, however, there had recently been a serious re-think of the strategy. The original proposal announced by the minister in March was for a bridge widening project based solely on the need to evacuate the area in the case of a serious bush fire. Now VicRoads were presenting us with alternative solutions which also take into account the ever increasing daily traffic congestion in Warrandyte. CONSIDERATION is being given to a providing a roundabout on the north side of the bridge instead of the proposed traffic lights. IT is intended to increase the length of turning lanes on Research Rd for traffic approaching Kangaroo Ground Rd. A NEW turning lane eastbound on Yarra St is proposed to be introduced at the roundabout, so there will be a separate lane for left turning traffic going across the bridge (able to hold about four vehicles), and a right-hand lane for vehicles proceeding straight on towards Ringwood. THERE is mention of a new pedestrian crossing at the roundabout on the west side, but details of this are scant. NONE of this work will commence this year; it will be done after the upcoming bush fire season in time for the 2017-2018 season. It was previously planned the traffic lights would be installed by November this year: this will not happen. The proposed revised timeline is… July-November 2016: Design, services and pre-construction. December 2016: Advertise works. Early to mid 2017: Contract awarded. Construction begins. Late 2017: Construction ends. Most of the attendees the Diary spoke to during the evening did not want these changes at all, and although frustrated by the current traffic jams and bottlenecks felt these changes would not only detract from the village atmosphere of Warrandyte but would attract even more vehicles to the area. There was almost universal acceptance a roundabout north of the river would be far preferable to traffic lights operating 24 hours per day which would be a complete eyesore. However, some Kangaroo Ground Rd residents expressed concern a roundabout would complicate the morning traffic flow and southbound traffic on KG Rd would be locked out by south-turning traffic from Research Rd. A diagram was provided on the reverse of the Information Update brochure, which purported to show the morning and evening congestion overlaid with other plots showing a vast improvement after the works would be completed. This was met with disbelief by many and VicRoads staff, when asked, were unable to provide any data to back this up or substantiate these projections which most people did not think were attainable. The general consensus was all this work was just fiddling around the edges and the real solution was to take the long-distance traffic away from the area by completing the north-east link of the ring road. It was disappointing at this stage there were no artists impressions of what the updated bridge would look like, and more particularly what the cantilevered pedestrian walkway would look like. We did, however, gather the latter is to be on the west side of the bridge. Reports from those who attended the workshop sessions indicated most people were of the opinion they did not want the bridge upgrade and associated works, and had not ever been consulted on same. We are told the mood became quite agitated, and senior VicRoads staff were summoned to come back into the room to be told this. Again this showed the disconnect between the expectation of the attendees versus that of VicRoads. VicRoads has funding for these works and their brief is to go ahead and implement them. What VicRoads presumably wanted to get out of the evening was information as to how to implement the changes. Many attendees, however, were trying to make a point that they did not want the works at all, which was not VicRoads decision to make! To VicRoads it is a done deal. A feedback form was provided to attendees and they were encouraged to complete it and send it to VicRoads. Their online engagement page on the web stayed open until July 31, and residents were encouraged to log in and leave comments. VicRoads would not commit to a specific timeframe or process for further community discussion or for their making a decision, particularly with regard to whether to go ahead with a roundabout or traffic lights on the north side. Rather, they would produce a report which would go to senior VicRoads management and a decision would be made in due course following community input. Obviously rm decisions would have to be made before December as that is when it is proposed to advertise the work for tender. WCA spokesman Warwick Leeson told the Diary WCA continued to be very concerned at the lack of ongoing process for community views to be taken into account. WCA would be organising more opportunities for community engagement in early October and would invite the Minister for Roads and Road Safety Luke Donnellan, Emergency Management Commissioner Craig Lapsley and senior VicRoads staff to be involved. Mr Leeson indicated that although originally launched as an initiative for bush re and emergency evacuation, they now understood the bulk of funding was in fact coming out of the general allocation for traffic improvement. WCA was particularly concerned as a huge amount of local effort over the past few years had gone into making people aware of the bush re dangers and the need to leave home well in advance on Code Red days or on other danger days if householders are not capable of staying and defending. Yet some say this latest government action lies in the face of that advice and implies the bridge will be safe and last minute evacuation will be acceptable.